We listed up our recommendations for you ! MonotaRO offers Work benches and more. You can buy them anytime from our Malaysia online store. Specification: Assembly type, Number of Steps: 1, Foot Bar Width (mm): 200, Top Plate Height H (mm): 300, Overall Height (cm): 30, Maximum Working Load (kg): 150, Purpose: For work in factory or warehouse. Material: POLYVINYL CHLORIDE (PVC), Thickness (mm): 2, Weight (ｋg): 18, Dimensions (Width x Length) (cm x m): 91x7.5, Surface Leak Resistance (ohm): 106, Purpose: Electrostatic protection. Mat of working bench, shelf, and floor. Finishing Material: Screw: general structural carbon steel pedestal: Steel, Dimensions B (mm): 60, Dimensions k (mm): 16, 2014 TRUSCO Published Page: 1-1670, Purpose: Machine tools, vending machines, conveyor, work bench, computer rack , control panels, physical and chemical machinery. See more results of "Work benches"
You will find Torque Wrench Set and Torque Screw Driver and more ! One Level Aluminum Alloy Work Bench and Stainless Steel Workbench Caster and other alternatives. Want Gardening Pouch and Singer Solid Type Electric Rock Mask ? Click Here. For more details of For Work At High Places Split-Toed Heavy Cloth Shoes With Rubber Soles Magic Amg and FX Select Working Clothe Jacket Type Short Sleeve, click here ! 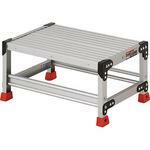 Step Ladder and One Level Aluminum Alloy Work Bench and others. Find Perfect Specific Chemical Signs and It'S Poke L Type Safety Blade For Your Need ! Our popular products as Ethernet HUB and 100BASE-TX Switching Hub can be viewed here ! Want Auxiliary Workbench and Stainless Steel Workbench Caster ? Click Here. Check our Woodworking vice and Woodworking Saw here as well ! 9.5sq. T type handle and Car Mat Cover and other MonotaRO's offers ! Liquid Level Relays Standard Set and Electric Works Gloves and other related products.